New Zealand elections were based on the British model with which almost all of the colonists were familiar. Along with the model came the vigorous assertion of a programme of reforms known as chartism. In the late 1830s and 1840s calls for universal male suffrage, the secret ballot, electorates of equal size, annual elections, the abolition of the property qualification for parliamentary candidates and the payment of members of Parliament were the key demands of a mass movement. The great waves of migration from Britain brought these ideas to the Australasian colonies. New Zealand settlers’ desire to create a better Britain included leaving behind the violence and corruption that were commonplace during elections. 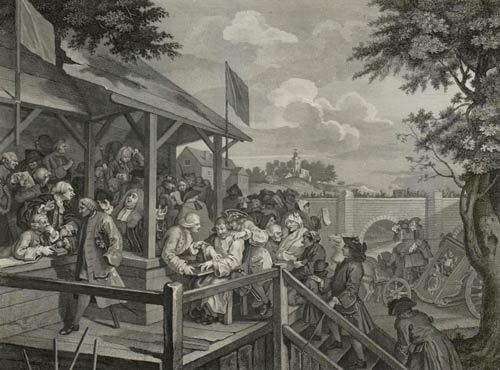 This 1801 engraving by Thomas Cook (based on a work by William Hogarth), shows an English polling place.